Regardless of whether it is a lay person or a professional rescuer, the ERC guidelines place a greater emphasis on the importance of CPR and advocate the prompt initiation of effective bystander CPR to significantly reduce mortality due to out-of-hospital CA. 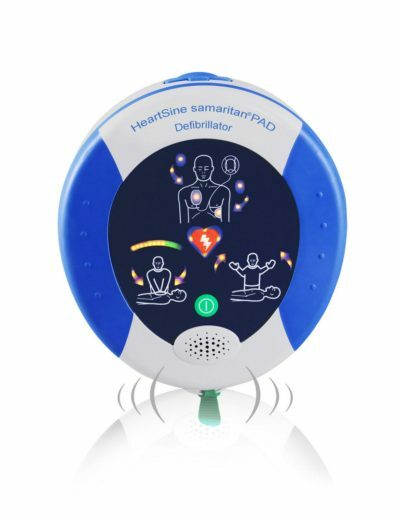 HeartSine can now provide a device to support these guidelines the introduction of the HeartSine samaritan PAD with CPR Advisor model500P. The HeartSine® PAD500P uses an Impedance Cardiogram (ICG) to assess how good the CPR is - are the compressions fast enough? Hard enough? The Impedance Cardiogram (ICG) measures Impedance changes in blood volume in the chest cavity which determines effective CPR. Since the blood-flow is related to how fast the compressions are applied as well as how hard, the PAD500P can guide you on both - for example - ‘push faster, good compressions’ means the compressions are too slow but the pressure is good. Includes carry case and one set of adult pads (which includes battery).